"Maybe it will snow today," my brother exclaimed. My mother for the umpteenth time just shook her head then said, "It's not going to snow. It doesn't snow in South Texas. Maybe in San Antonio and every once in a while in the Hill Country, but not here in South Texas." To which my brother replied, "It could!" My mother, knowing that there are certain battles worth winning and this wasn't one of them, rolled her eyes heavenward and unconvincingly agreed with him by saying, "You're right. It could," which always left a smug look on my brother's face. You see, my brother and I had always wanted to experience snow. Having been born and raised in the tropical climate of South Texas, we'd never even seen snow other than on T.V. You know the saying, "The grass is always greener on the other side?" Well, our grass was most definitely green on our side, but all we wanted was that white snow on the other side of the fence. Every time a cold front was supposed to blow-in getting us anywhere near freezing temperatures, the meteorologists [probably out of sheer boredom of constantly saying "...there's no rain in the forecast and there will be clear, blue skies today..."] would always tease us with "We may get some snow." We'd always roll our eyes heavenward and go about our business as usual. We never did see any of that snow. Today my brother would've been 30 years old [which definitely makes me feel old...]. I say, "would've" because Patrick Nicholas Marshall courageously battled a very rare mitochondrial genetic disorder that slowly robbed his body of its energy until one day there was no more energy to sustain his life. He passed away in 1997 at the age of 18. Because of the rarity of his disease, my father and I did an extreme amount of research on the internet on his particular disease, MELAS. Of course, this was "back in the day" when there weren't very many people using the internet. The thought has crossed my mind more than once that maybe some of my love and know-how for internet research came from this time period in my life. Who knows? I learned a lot both from Patrick's life and his death. So much that I think I could fill a book with his story [which I plan to do some day...]. However, one of the things I wanted to share with you today on his 30th birthday is about family relationships. In your genealogical research, have you come across any households where there are one or more extended relatives living there? Maybe an uncle and aunt raising a nephew or niece along with their own children? Or maybe grandparents raising grandchildren? I've come across it many times while researching especially in census research, and it always gets me to wondering. You see, Patrick wasn't my biological brother, but my nephew. He was the son of one of my older sisters, and the same disease that robbed him of his energy and life, has also robbed my sister of her mind, leaving her incapable of taking care of herself [much less anyone else]. So, my parents adopted Patrick, and after being the "bonus" baby of the family who was so much younger than her siblings, I got a "much-wanted" brother [definitely a bonus for me]. Our relationship has always been a little confusing to explain to others. I always tell people that it was easier to live it than it was to explain it. So, when I see the myriad of households in the census with a "mix" of relatives, I always wonder what their relationship was ~ the one "lived", that is. What was their story? I still remember in 8th grade science learning about the mitochondria, which is basically where all the energy is made for the body. My best friend and I used some memorization tools to help remember what the mitochondria was and did. The "M" stood for "mother", indicating the distinct maternal inheritance that the mitochondria has [in other words, it's passed down only through the mother]. Also, the "mito-" prefix sounded like "mighty", indicating that mitochondria were the "powerhouse" of the cell [meaning that's where energy is made]. The one thing we didn't learn was what happens when the mitochondria can't make the energy in the cells of organs that the body needs to sustain life. That particular lesson I had to learn in real life. In a nutshell, here is a brief explanation of the mitochondria: There are anywhere in between 500 and 2000 mitochondria in each cell, all working to make energy for that cell. There are thousands of cells in each organ in the body, and our body is made up of organs. Each organ needs a certain amount of energy to carry out its job in the body. Not all organs need all of them working at 100%. For example, the liver can get by with only about 80% of the energy it needs. However, organs like the brain and the heart need everything working at a 100%. Anything less and things start to go a little haywire, to say the least. The only reason I mention all of this is that because of Patrick having this disease [as well as my sister and mother], I have looked "down" my family tree and thought about the consequences of the disease. What I mean is that I and my children have been genetically tested for this disease, and I have thought about the repercussions of the disease going forward in time on my children and future grandchildren. That was until I had read about mitochondrial genetic testing for genealogy a while back, and how it can help to find maternal ancestors. I had never thought about this wonderful aspect before ~ looking "up" my family tree to find maternal ancestors based on mitochondrial testing. How mighty this organelle called the mitochondria truly is! Patrick was in every way that matters my brother. He and I fought and annoyed each other, but that was only an indication of our closeness. I had always thought we'd be together, and letting go of him was one of the hardest things I have ever had to do. In his short 18 years of life, he taught me many things, but most of all, he taught me not to give up. Two days before his funeral the weather man was reporting that on Friday [the day of Patrick's funeral], we were going to be getting a cold front, and as usual, he teased us with the phrase, "It may snow." 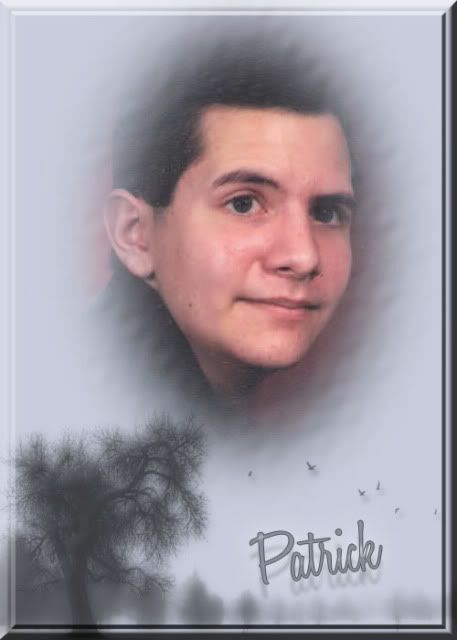 Though we had tears in our eyes and heavy hearts, we rolled our eyes heavenward, then continued planning Patrick's funeral service. On the day of the funeral it, indeed, was very cold and there was sleet, but no snow ~ not that we expected any, really. The last hymn we sang was Amazing Grace as we followed his casket out of the church. Once outside the church as we turned to proceed down the sidewalk to the hearse and the limousines, tiny snowflakes began to fall on Patrick's casket, on the cars, and on the ground. Of course, they melted just as soon as they hit ground, but they were falling. My mom and I looked at each other with tears in our eyes, said to each other, "It could," and burst out laughing [...another Steel Magnolia moment for me]. To this day, no matter what "it" is, I know that "It could." For more information about MELAS and other mitochondrial disorders, please visit the United Mitochondrial Foundation (UMDF) website. Wonderful tribute. I'm at a complete loss for words. Patrick has obviously left a huge legacy of love; your tribute is absolutely wonderful. Family relationships and love are not defined by genetic relationships, what an eloquent reminder. Lovely post, Caroline. Your brother would be (is) very proud to read this special tribute. I finished reading and my daughter asked, "Why are your eyes and nose red, Mommy?" A lot going on in that post. I think the previous commenters have said what I want to say. A beautiful thoughtful post is all I can add. That was a wonderful tribute. I have tears in my eyes, especially since my little cousin has a rare mitochondrial disease. He is a year and a half old now. He was developing fine until about 11 months old, and then his mom noticed that he was actually reverting in his development. She took him to a specialist just before his 1st birthday, and they finally diagnosed him several months later. He has a therapist come every week, and he is doing really well now. He's such a little ham. I will have to put him in my Wordless Wednesday cousin series post soon.